SUGAR is SUGAR right? Wrong. It doesn’t make sense to lump all types of sugar together and call it BAD. Sugar comes in all types, and it is important to distinguish what’s good for your body and what clearly isn’t. It has become mainstream to think of fruit as EVIL in diseases and disorders such as Diabetes, PCOS, Obesity, and Candida. Unfortunately, our culture and even some healthcare professionals associate fruit sugars with high-fructose corn syrup (HFCS), processed cane sugar, sucrose, lactose, and other sweeteners. They believe that sugars from fruit react the same in the body and spike blood sugar leading to further insulin resistance. The fact is that sugar in fruit is not processed the same way as other simple sugars. 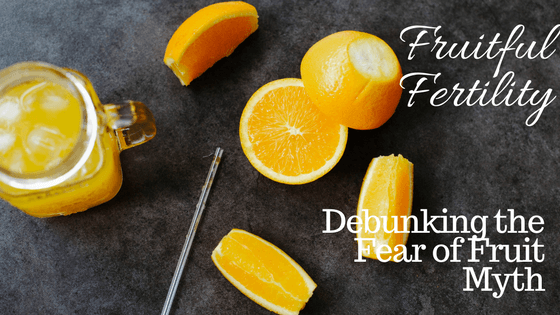 The fructose that naturally occurs in fruit is actually bound with other substances or compounds such as antioxidants, polyphenols, anthocyanins, phytochemicals and more that actually KILL off candida and other viruses in the body. Second, the sugar from fruit is normally eliminated from the stomach within 3-6 minutes, so it doesn’t even reach the intestinal tract. The sugars you want to be avoiding include corn syrup, processed cane sugar, table (white) sugar, beet sugar, agave nectar, etc. The obvious desserts, baked goods, gluten and even white potato should be avoided as well. I am currently reading Medical Medium: Secrets Behind Chronic and Mystery Illness and How to Finally Heal by Anthony William and the knowledge he has in this matter is profound. I just can’t get enough of it! If we look at fruit as the enemy, it would be a disservice for your hormones and your womb. Without fruit, fertility is at risk. Picturing your womb as a bountiful tree full of flowering fruit is a great way to think, and well, it needs a lot of nutrients to nourish it’s fruit (and it get’s it from….fruit!). A woman’s reproductive system, with a diagnoses of PCOS or insulin-resistance or not, depends on fruit and specifically the fructose and phytochemicals it is bound to. Along with the vitamins and minerals that fruit contains, the additional phytochemicals, polyphenols, bioflavanoids and pectins have powerful anti-tumour effects & anti-cancer antioxidants which ultimately help stop PCOS, pelvic inflammatory disease (PID) and an overextended reproductive system (ie. unexplained infertility). So stop being afraid and GET YOUR FRUIT ON! Let’s see those flowering and fruitful trees in abundance. I personally enjoy wild blueberries, citrus, bananas, apples and raspberries.